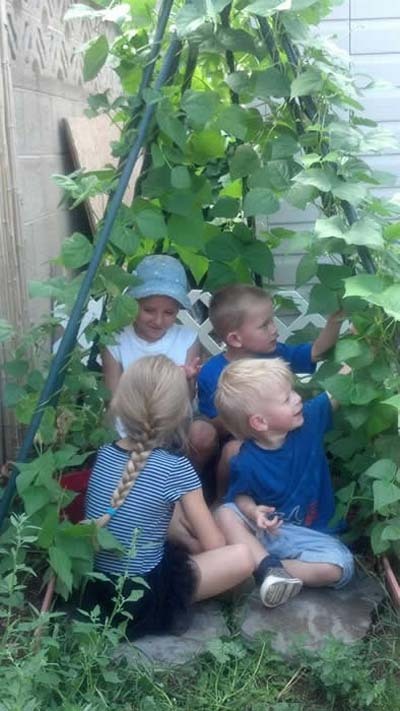 As a family childcare provider, Fairyland Day Care was able to use their entire backyard in the design of their Nature Explore Classroom. The space has developed over a period of 14 months with the help of daycare families and with hours and hours of hard work! The yard has been designed so that all the areas surround the middle open grass area, allowing children to have plenty of space for large-motor activities. Anarch was built to welcome all into this special place with vining flowers and potted trees planted on both sides, adding beauty and appeal. Tree cookies and branches were donated by families and friends to fill the Messy Materials Area. 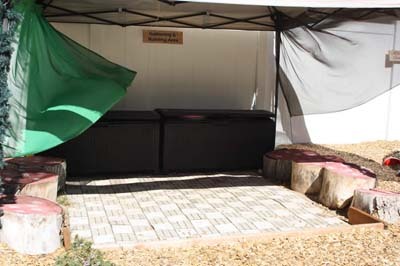 A block building table, gazebo for shade and wooden tile flooring was added for a building spot. 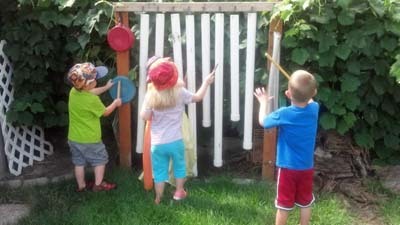 Situated on the south side of the yard is an area for nature art. This space is made up of two tables, an umbrella, a beautiful grapevine and handmade easel. This provides a comfy spot to write and do various activities with natural objects. A small storage shed close by has items that are always accessible to the children. 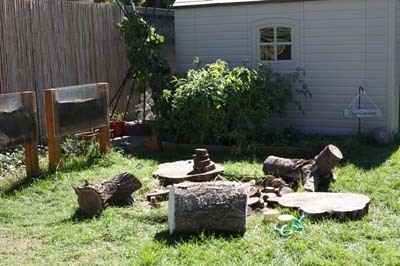 The Music and Movement area is defined by a log border and contains handmade chimes and household items used for drumming. The children use scarves, maraca’s, bells, a parachute and many other items in this area every day. There is also a playhouse for the children to use for dramatic play and also serves as a cozy corner for reading. A big box of books is located nearby. 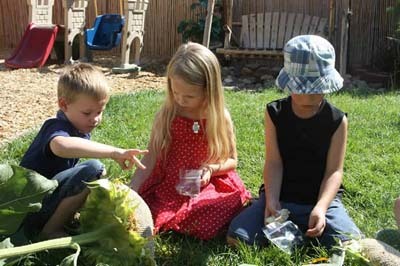 A vegetable garden, flower garden and grapevine give the children a variety of live plants to learn from and explore. 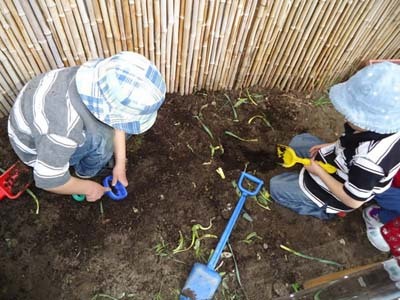 Each year on Earth Day, the flower garden is prepared and the children choose plants and seeds for the year, tending to them throughout the season with gentle care. They had a great harvest this year! A root-view planter and a green bean tipi were also built to add interest to this area. A red maple was planted with all the children two years ago and is growing strong! The Gathering Area is located under a gazebo with tree house fabric on either side to define the space and add beauty and appeal. Tree stump seating was designed for this space and painted to look like “mushrooms”. Ample storage space is found throughout the outdoor classroom to store loose parts. 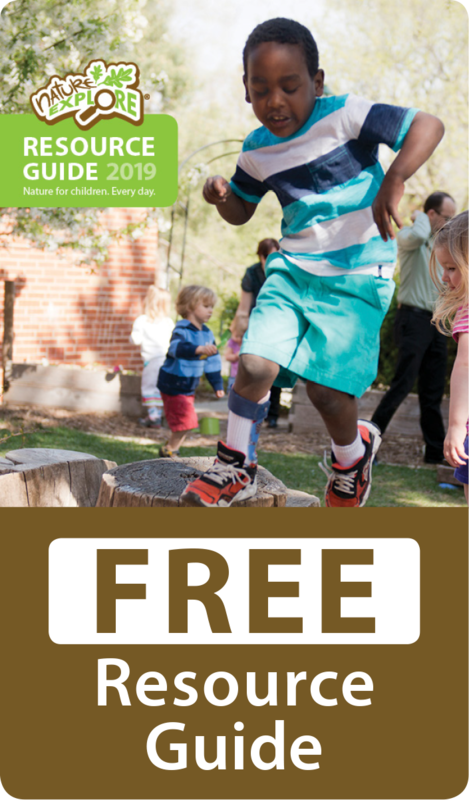 A drinking fountain and water table are located near the sandbox and mud/digging area so the elements can be used together and a concrete area allows children to use wheeled toys, wheelbarrows and lawnmowers. The concrete wall on the east side of the space was covered with bamboo sticks to make the outdoor classroom more appealing. 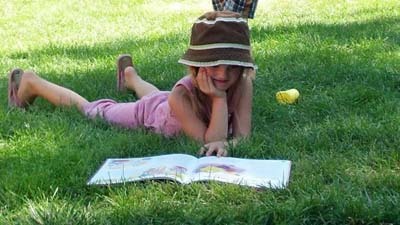 Fairyland Day Care is a Utah state licensed facility and accredited by the National Association for Family Child Care, meeting all outdoor standards.